In 2014 I created a fun challenge for myself. I wanted to play the 100's of games I had collected over the years. I wanted to play those games for Extra Life. I made simple rules. Play one game a day for 100 days up to the official national day of play for Extra Life, and then participate in the 24 hour marathon. I had no idea really how I would do this. I am not a young man, I have a wife, child and job. But I knew it was gesture to the kids and their families in Children's Miracle Network Hospitals who spend hours, days, weeks and years receiving treatment and care. And I would be able to play a ton of games. I would love it if you joined me and others in this challenge. Play what you want, how you want for 100 Days up until the national marathon (This year, 2016, it is November 5th). 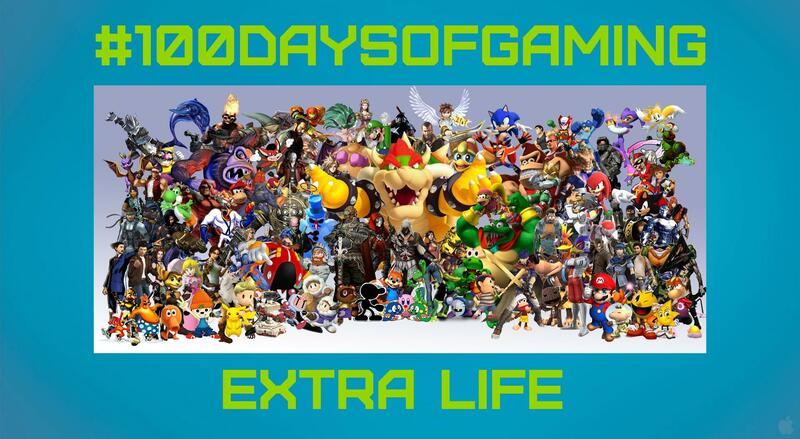 Use the hashtag #100daysofgaming on social media and use this forum to share your experiences, thoughts and feedback! Send me a direct message in this forum if you have any questions. Also, connect with @Zyaldar who has been instrumental in seeing that this challenge has grown this year and last. Here we go! I have been playing games each day for the past 36 days. I have been trying to spread the word about Extra Life, earn some $ for the sick kids and have a great time. I won't lie, there are times when I have no views, but I have had a handful of folks chat with me about it so there is that. I play a new game everyday leading up to the main event on 10/25. If anyone is interested you can check it out. Heck join in, or whatever, lets get people pumped for October! Cool idea! Do you have a list of games youre planning to play? I do! I have it in ten day blocks. Every ten days I post the games I will play and then post ten more on the tenth day. You can see that on my channel page on twitch. I also have been highlighting the games on my YouTube channel. The next three days is Morrowind, Oblivion and Skyrim. I play for about an hour a day or so. This is a cool idea. The Baltimore Extra Life Guild is doing something similar, but we are calling it #RoadToExtraLife. We are planning events such as a day of play with the kids at our local hospital. Collaborating with radio stations to do an event, as well as trying to work with local news stations to promote extra life as it gets closer. Keep up the good work! I'll try to tune in to your stream at some point over the next few weeks (school starting kind of hectic here haha). Keep up the good work! I'll try to tune in to your stream at some point over the next few weeks (school starting kind of hectic here haha). Oh boy do I know that. Thanks for the tips. Trying to get the Denver Guildies to rally around this too. At the very least it's a blast and its getting the word out. This is a really neat idea! I would love to jump on board with something like this. How many hours do you play of each game and do you start a new file or just pick up wherever you left off if it's not a new game? Gah! Sorry, I thought I had notification on this thread! Thank you for the follow by the way! Most of the games are games I haven't played yet so I just start from the beginning. But others I just pick-up where I left off. It's been great. Awesome idea! I'll be sure to check out your stream. Best of luck to you! Sure no problem! I think this is a really cool idea and I may try doing this and using the same hashtag in my posts/tweets. I'll probably start it after the Event but it sounds like a fun challenge to play a different game for 100 days. Keep up the great work and I look forward to what game you play next! That is awesome, I would love for this to become a thing. I will follow your progress. I has been fun, but challenging for sure. I have no shortage of games, that's for sure. I am happy to report that this was a great success! I'll check these out when I get home from work! Congrats on being a success and can't wait to do this challenge myself! Very cool man!! I loved that you put the names of the games you played in your video. I think I might try this as well; looks like it was a load of fun. Good Luck in Florida!! Thanks friend! I hope folks consider joining me next year. I think it could be fun to compete and support each other. For the kids! Getting so excited for Florida. Hey @herobyclicking! Are you planning on doing #100daysofgaming again this year? If so when do you plan on starting because I would be interested in doing this challenge! It's not the best Photoshop skills but I tried my best! This idea is awesome and so is that pic dude! Thanks! Expect to see this posted all over Facebook and twitter! I have been the worst on the forums. Yeesh. Yes, I am mostly ready for this insanity. I am so, so happy to see you joining me. If you see anything on my list or have a suggestion, please join. Hell, play games with us for the next 100+ days. Checked out your games- they look good. This is an incredible task you guys are doing- I salute you! It sounds like we have quite the participation this year! I am very excited to take on this challenge! I was going at 3 this morning, where were you Z??? As you might be able to tell from my first game I posted on my FB account, I am expanding on this a little beyond just video games. I'm going to incorporate simple games (Like my I spy from last night), board games, card games, and quite possibly some sports . I cant stream video games, so I am going the route of well rounded game play. I lost I Spy to my wife..... She has 20/20 vision, though...so I say i had a disadvantage.....yeah that's the excuse. There were lots of people around too...and lots of stuff going on....So it make it more difficult.